What do you call a grouping of cheetah? A coalition? The definition of coalition is a temporary alliance for a combined action. A coalition is more commonly used to refer to a group of males that have banded together to be more successful in holding a territory. Although classed as a solitary cat, cheetah could easily be believed to be a social carnivore as they are often seen in groups, but these groupings tend to be females with cubs, youngsters that have just left their mother, or a group of males. The image above captures a semblance of all these groupings - a female (lying down) and her subadult offspring (5) that are about to go their separate ways and two territorial males showing intense interest in the female's markings. 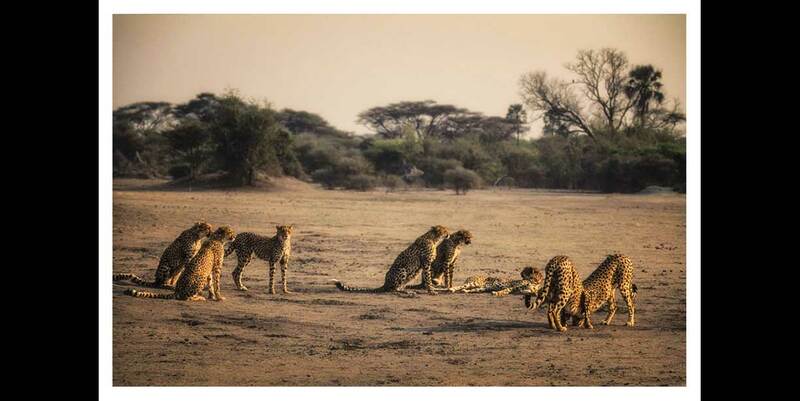 A unique moment in the social organisation of cheetah.